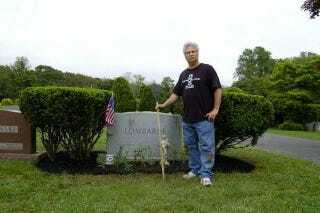 Vince Lombardi was buried with his wife and parents in a little cemetery in Northern New Jersey. Almost immediately, it was abandoned to the elements. "The grave was in total disarray," said Gary Martin, an ex-policeman. "You couldn't even read his name. It was totally overgrown. It took a lot of work. You can't believe the work it takes." So for the last 25 years, Martin, and Martin alone has been tending to the gravesite. He cut down the overgrowth that had covered the plot, keeps the bushes trimmed, spruces it up with fresh woodchips, and regularly leaves flowers. So let's see: we've got total strangers maintaining Lombardi's old house as a shrine, and a total stranger keeping his last resting place presentable. It's not surprising considering the stories about his abusive home life ("The Lombardis never should have had children," says a family friend) that Lombardi remains loved only by those who didn't know him.